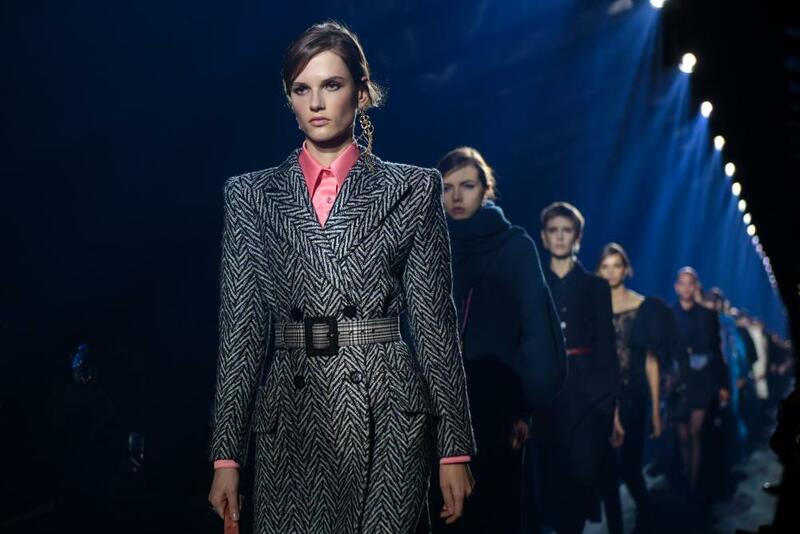 With a new sculpted feel, Givenchy Fall Winter 2019 collection by Clare Waight Keller reconciles geometries with an innate softness, revealing a seductive glimpse of Givenchy allure. At its genesis, the origin myth is invoked – the temptation of Adam & Eve intertwined, touched by a polished sense of individuality. The ever discreet Waight Keller insisted, however, that she was referring to the early 1990s trend for models with aristocratic backgrounds – “girls like Jasmine Guinness, or Honor Fraser”, who wore haute couture on the pages of Vogue with an insouciant attitude, as if a taffeta gown was some old thing found rumpled in a suitcase in Granny’s attic – an attitude that came naturally to those for whom Granny’s attic was full of haute couture. This was a looser, more fluid, Givenchy than the sharp tailoring of recent seasons. Waight Keller is still, she said, “obsessed with tailoring”, but in between an opening section of belted suits and coats with high, pinched sleeveheads and a standout evening suit with a single jewelled lapel echoing the monochrome look that opened January’s haute couture show, the daywear centred on Japanese-style pleating, ingeniously constructed on floral printed fabric on which the design, stretched out of recognition when flat, comes into focus once pleated. The muscle of an unofficial royal fashion warrant made itself felt in the front row, where actors Rebel Wilson and Rosamund Pike flanked singer-songwriter Sam Smith. Sitting nearby was Wonder Woman herself, Gal Gadot, and F1 driver Lewis Hamilton. The show also confirmed Givenchy’s position in the vanguard of fashion by reinforcing several emerging trends for next season, from exaggerated shoulders to tiny handbags, and from the new “midaxi” hemline – longer than a midi, but just above the ankle.